As recently as this past spring, executives from telecommunication companies told me that Apple would never include near field communication in a handset, instead opting for the ubiquitous Bluetooth Low Energy. Well, in September Apple proved them wrong and included NFC into the iPhone 6 and 6 Plus, launching Apple Pay. Apple has agreements in place with Visa, MasterCard and American Express, along with numerous banks and dozens of retailers. The service launched in late October and I decided to take it out for a test drive. Enrolling the cards was easy. I included the card associated with my iTunes account and then decided to add my debit card as well. For that, I took a picture of the card and it was quickly added to my passbook. I also had to go through a process of confirming my iTunes card as well. After both were enrolled I received emails from my banks confirming the enrollment in Apple Pay. Now it was time to make some purchases, and first on my list was at Walgreens. After the clerk rung up my purchases I placed my phone near the point of sale and the screen just lit up. It showed both of the cards I had enrolled, and by simply touching one or the other, I would be able to use that particular card. For the first purchase I choose my debit card, touched my fingerprint on the Touch ID scanner and received the short vibration prompt back confirming the purchase was complete. But in this case that wasn’t entirely true. Since I used a debit card, the point of sale asked for my debit card’s PIN and then took me through the rest of the prompts – cash back and confirm amount – before finalizing my transaction. The next couple of purchases I made I used my other credit card and it worked perfectly. I simply held my phone to the terminal, touched the fingerprint scanner and it worked. I was even able to pay for a cab that had a contactless terminal equipped. I had previously tested a case that enabled me to make payments using my iPhone 4 and the biggest issue was activating the phone, launching the app and then making the payment. The fact that when you hold the phone up to the terminal it just works and enables you to choose which card to use makes Apple Pay very easy to use. And then there’s the added bonus of these transactions being more secure. They’re authorized with a fingerprint, while on the backend all the Apple Pay transactions are tokenized and account numbers aren’t. 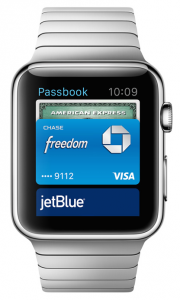 It will be interesting to see how Apple’s NFC technology evolves. They’re making money off of each payment and it will be interesting to see how they open up the NFC protocol to hopefully enable physical access control or other applications to take advantage of the new iPhone’s NFC chip. 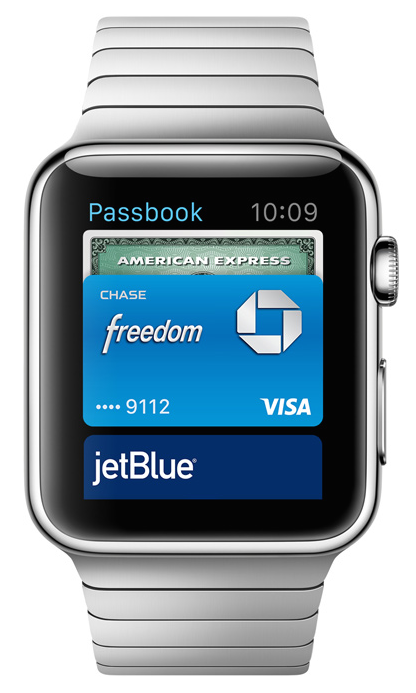 Apple will also be including NFC in the Apple Watch coming out in 2015.